My shift cables were like this. First off you need to gather all your tools and decide how you plan to go about the change. You could possibly do this without going underneath your car or jacking it up, but what I did involved jacking it up. If you are going the underneath route you need more tools. Jack up your car, place a jackstand underneath and take off you wheel and inner fender. 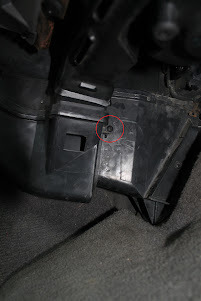 The inner fender has a torx screw underneath the rocker panel area right by the driver's door that is hard to see as well as some phillips screws. 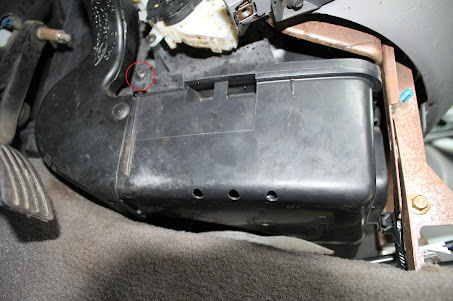 Then take out the air box by unhooking the tabs and unscrewing the screws. There is one screw on the passenger side and one on the driver side. Passenger side. This one is not the easiest to see but it is there. Driver's side. That other plastic fastener does need to come off but it could if you want. To make things easier take away the air tube to the back seat. I had to bend mine to get it to come free from the seats so be careful if it is really cold out when you do this as it might break. Next cut away the carpet covering the shift cables. Make sure you cut wide enough to get to the bolts that hold in the shift cables. Pry them off the shift tower itself and then untwist the knobs holding them to the shifter base. Pull up after you have untwisted them enough. Unbolt the two bolts holding down the rubber seal. Now it's time to get under the hood. 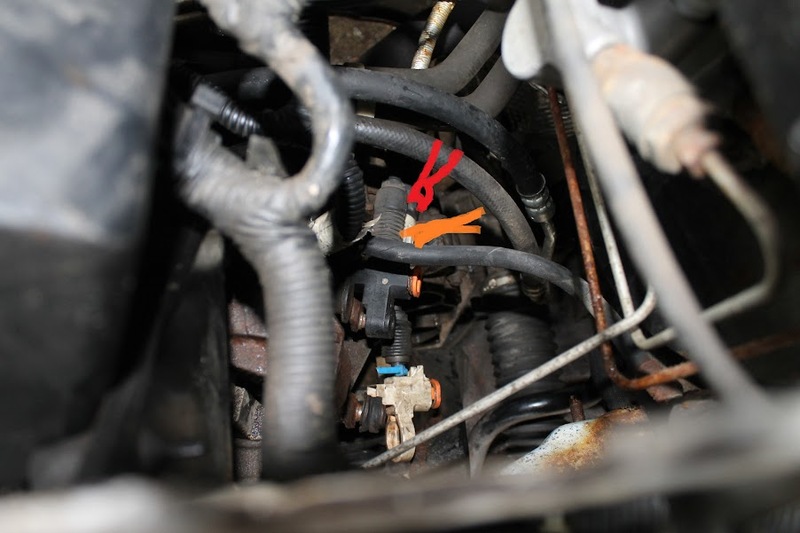 Remove your airbox and your fuse box. Mine just pop off when you pull on them. Supposedly not all of them are like this. Then you need to pop off your old shift cables. If you look in the picture you can see that the rubber bushing is still stuck on This isn't all that easy to get off. I cut off all the rubber with wire cutters. Then I used two screwdrivers to pry off the metal part which was still stuck on. I had to pry on both sides simultaneously or it wouldn't come off. It took me a while to figure this out. Then pry off the other cable end. I used a pry bar and it came right off. Now comes the fun part. You can try to untwist the knobs holding on the cables with your hands, but unless they are super strong and super small at the same time it won't work. Attach the vise grips to the knobs and untwist them with the vice grips. You will need to twist them and unlock the jaws and twist again several times if you shift cables are like mine. Do the top cable with the black end on it first. The picture shows on the white cable what I did. Your shift cables are now free! You can now go in the car and start pulling them out. However, if they are like mine, they will get stuck on the exhaust shield, since there is a protective metal shield over them with lots of ridges on it. To get rid of this problem, go underneath and move the exhaust heat shield out of the way. You may need to drop the exhaust to do this. I did not have to because my exhaust support is broken. Your cables should now pull free. Installation is mostly the reverse of removal, but you need to careful of some things. When you put the knobs into their support there is a little plastic ring in between. It helps keep the knobs from closing down on you while you are putting them in. It comes off after they are installed, so don't worry about that. 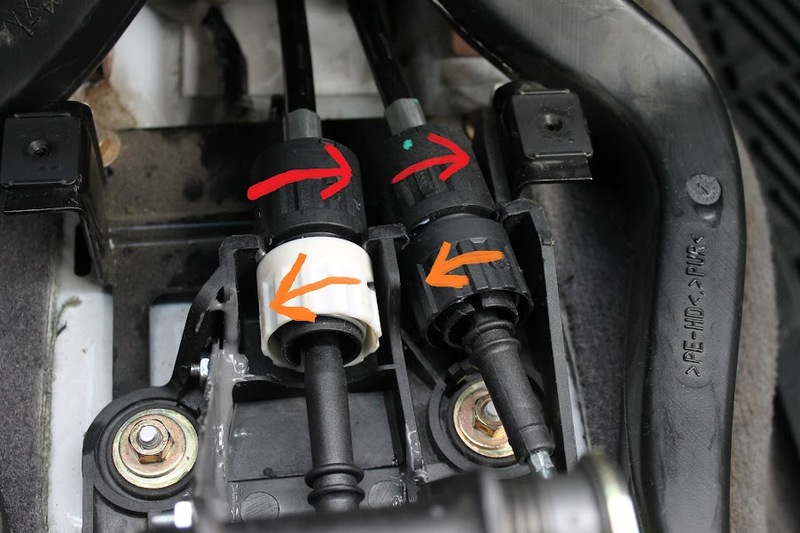 You also need to make sure that the orange button protrudes from the shift cable end. In this picture the button in the white end is correct and the one in the black end isn't. If just the white one is protruding you may not have reverse, at least I didn't. Mods. I wasn't sure if this should go in the general or Mk1 forum so if it is wrong please move it. Nope, just fine where it is. We've moved it into the How-To Archive. If the Mk1 mod wants to put up a link to it in that forum, then I'm sure that's ok especially since this only applies to early Focis. Added this to the how-to archive. If you want to email me your address and color preference I can send you out a couple of decals. I was wondering if there is a video showing how to adjust my cables. I already installed them. And Both orange clips are showing. The Gearbox counterweight has plenty of space. But I still can barely shift it into reverse. and The fluid level is topped off. The only thing I believe is left is to just adjust them. But I'm confused by just reading it. The cables don't seem to have that much play to begin with. I would really appreciate if you could help me out. All I had to do was hit neutral and had someone hold the shifter dead center inside, then hit the orange buttons. I heard them move a little when I hit the buttons. The main thing is to be sure your in neutral. 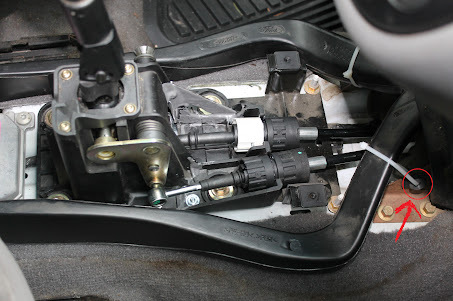 Not an expert, but if you can't hold centered on the shifter and stay in neutral, you may need to hold the button and move the shift linkage by hand. I just wanted to tell the op thanks for the write up. 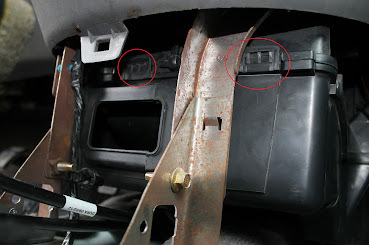 Great job identifying all the hidden screws on the interior. Still lots of wiggling things around to get them moving on this job though. She's done now and shifting great. Now on to the lower ball joint, lol. EarlK and alafrosty like this. Have you tried a local or on-line Ford Dealer? Village Ford, Tasca Ford, Autonation White Bear Lake Ford?